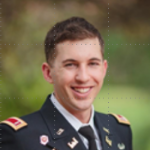 Brett Everett graduated from the United States Military Academy in 2012 with a degree in civil engineering and was commissioned as an Army Engineer Officer. His first assignment was with a horizontal engineer company at Fort Lewis, WA where he also deployed to Afghanistan. He later worked as a structural engineer at the United States Army Corps of Engineers Rock Island District and became a licensed Professional Civil Engineer while acting as the facilities officer at III Corps HQ, Fort Hood, TX. Brett will be pursuing his MBA at the University of Chicago Booth School of Business as a member of the Class of 2019.